CES NEWS: Polk Audio goes wireless with new surround speakers and subwoofers | What Hi-Fi? The US speaker company will unveil its new Wireless Surround F/X and DSW Pro Digital subwoofer ranges in Las Vegas. The Wireless Surround F/X is a single speaker with four full-range 2.5in drivers and a 5.25in woofer, powered by a compact multichannel DSP amplifier. It will cost $400 when it goes on sale in the second quarter of 2010. A small transceiver included with the system wirelessly connects your AV receiver's surround channels to the F/X. Polk claims its Controlled Dispersion Array (CDA) technology enables the Surround F/X to create "a convincing discrete left, right, rear and back surround soundstage". The system can handle 5.1 and 7.1 soundtracks, and features a three-position DSP control that optimises the sound depending on whether the speaker is placed on the floor, a table or shelf. 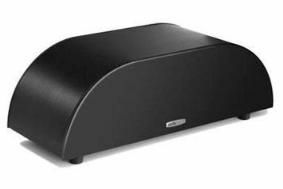 Also new from Polk is its range of wireless-ready DSW Pro Digital subwoofers. These connect wirelessly to most home cinema systems, without the hassle of cables. A simple plug-and-play wireless system consists of a small wireless dongle that connects to the subwoofers' amplifier plate. Because the system uses the subwoofer's power supply, no additional AC power connection is necessary. A separate wireless transmitter then connects to the user's multichannel receiver so bass signals can be sent wirelessly to the sub with no compression. There are three wireless subs in the range: the $449 DSW Pro 440wi with 8in woofer and 300W amplifier; the $559 DSW Pro 550wi with 10in woofer and 400W; and the flagship $679 DSW Pro 660wi with 12in woofer and 500W amp. All three work in conjunction with the $119 PWSK 1 wireless kit. Finally, Polk Audio is expanding its SurroundBar home cinema speaker range with two new models with matching wireless subwoofers. The SurroundBar 3000 is a 100W two-way system with a 6.5in, 80W wireless subwoofer. The speaker bar links to a TV via a single optical digital connection. It goes on sale in the US in March for $349. Second in the line-up is the SurroundBar 6000 SDA at $499. It features Polk's SDA surround processing. is a four-way design and comes with a wireless 7in, 120W subwoofer. It ships in June.